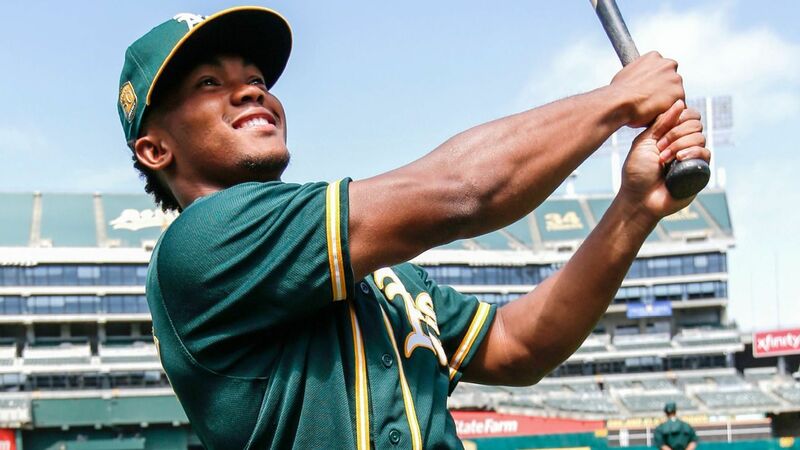 The Oakland Athletics can sign Kyler Murray to a major league deal and offer him significant guaranteed money to choose baseball over football without running afoul of Major League Baseball rules, league sources told ESPN, the latest twist in a sport-vs.-sport battle for the Heisman Trophy winner that’s expected to be resolved in the coming days. Top A’s executives, a marketing executive from MLB and others met Sunday afternoon with Murray in Dallas, sources told ESPN, to better understand what it would take for Murray to forgo a football career and sell him on playing baseball full-time. Murray is expected to declare for the NFL draft before the Monday deadline, though doing so in no way would preclude him from agreeing to a new deal with the A’s. Murray agreed to a minor league deal with a $4.66 million signing bonus after Oakland took him with the ninth pick in the 2018 draft. The A’s allowed him to return to the University of Oklahoma, where he put up historic numbers at quarterback and won the Heisman. MLB rules prohibit players from signing major league contracts, which place players on the 40-man roster, out of the draft. They are not allowed to sign amateur players to minor league deals, then immediately give them major league deals, because the latter would be an inducement to sign and a circumvention of the league’s finite draft pools. In Murray’s case, because he signed a minor league deal, and because his performance at Oklahoma changed the circumstances of his baseball career, Oakland would be within the rules to give Murray a long-term extension if that’s what it takes to keep him in baseball, sources tell ESPN. Even with a major league deal, Murray would likely begin his career at High-A Stockton, sources told ESPN. Whether the A’s are willing to give Murray a major league deal or meet his financial demands remained unclear after the meeting. Two sources told ESPN that the A’s expected Murray to ask for more guaranteed money. Mike Leslie of WFAA-TV in Dallas reported that Murray was demanding $15 million to play baseball. While the draft declaration won’t tip Murray’s hand, he is facing a decision. He is due into A’s camp, where he planned on joining the major league players, by Feb. 15. The NFL combine begins Feb. 26. Whatever sport he chooses, Murray, 21, will need to begin training for it sooner than later. Should Oakland decide to pursue a major league deal with Murray, it could guarantee him an additional signing bonus while allowing him to remain in the minor leagues to gain reps in center field. Murray would have four options, meaning he would need to join the A’s full-time at latest by the 2022 season, though Oakland intends to aggressively promote Murray. The A’s understand the allure of football, which has become clear in recent months as Murray developed from an athletic but slight quarterback to a potential first-round pick. At 5-foot-9, he would be the shortest quarterback in the NFL since Doug Flutie, who was listed at 5-10. With multiple football teams reportedly putting first-round grades on Murray, though, and believing they can scheme around his deficiencies in size by taking advantage of his superior athleticism, the prospect of Murray leaving baseball behind is real. And the A’s now have a choice to make.